Hi! I'm Skye, the air pup and aviator on the PAW Patrol. I am going to make a quiz called, Answering Your Questions. This quiz is the introduction to that one. You can ask me questions about anything! Questions like: What's your favorite mission you've been on? 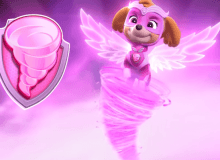 or Do you prefer Mission Paw or Ultimate Rescue? are some ideas. Hi! I'm Skye, the air pup and aviator on the PAW Patrol. OMG, I'm actually speaking to SKYE! I am going to make a quiz that will hopefully answer frequently asked questions about me. Yes! I have so many things to ask you! Hey, some of my friends are also making a quiz like this! First, you can only ask me questions in the comments of this quiz if you want them to appear in the quiz. Second, they have to be questions I could answer, not questions like, Who does Zuma have a crush on? because, how should I know!?!? @ above answer no, Everest! Third, I need to know your account name, because I want to give you credit for your question. To go with rule number three, I have other accounts on other websites. You can ask me questions there, as well. Have you got a Quotev account? I have a GTQ account, I'm fine. What!?!? But I like talking to you!